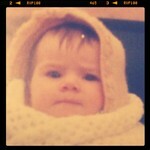 This is a baby me. So I'm Australian. This means that purely by chance I was conceived by Australian parents and when the time came to have me, my mother thought "I am not having a baby in England" and flew back to Australia, where I was born in Queensland, in a hospital. Her first Australian child she had in Papua New Guinea, in a hospital. Though if she'd known that the labour ward was the only one with air conditioning she would have pretended to be in labour about six months earlier. My Mum is Australian because her Dad was Australian. Her nationality no more of her doing than mine. Same story with my Dad. And their parents. Before that there was a little more proactivity with various great or great great grandparents leaving a life that was okay but not brilliant in England or Ireland to come out to Australia and provide opportunities for their children that they wouldn't get 'back home'. They came on boats. They were looking for a better life. After World War II - the Germans, the Poles, the Ukrainians, the 'ten pound Poms'. And more. In the 50s and 60s - the Hungarians, the Czechoslovakians. And more. In the 70s and 80s - the Vietnamese, the Chileans, the El Salvadorians. And more. In the 90s and 00s - the Bosnians, the Croatians, the Iraqis, the Sudanese, the Burmese. And more. You look at the surnames of our sporting heroes, our politicians, our singers, our celebrities, our colleagues, our teachers, our friends... pretty much all of them from families only in Australia for 225 years at best. Which is nothing. It doesn't make Australia 'ours'. It means that if you're more than first generation Australia you've been damn lucky somebody before you thought coming here was a good idea. Our political landscape is full of clowns but I can say that out loud without needing to fear for my life. I think our religious institutions need to catch up with the real world but I can say that without needing to fear for my life. I can discuss the differences between Sydney-siders and Melbournites - disparagingly if I choose and yet those differences won't see me in fear for my life. I can see that my skin is whiter than that of my friends and yet, that skin colour doesn't mean anything apart from regular sunburn. If I look at the opportunities available for my daughters and decide that they would be better elsewhere - I don't need to sell my soul to the devil or risk my life and theirs to change that for them. I am lucky to be Australian. I am not special. I am not unique. I am not more worthy. I am just lucky. And I don't know that if I'd been exposed to the fear, the violence, the death, the hatred, the uncertainty, the poverty, the prejudice that I would be strong enough to start anew, and not only do that but continue to believe in the good in people and to actively pursue a life in which I am a good person, a giver, a contributor, a neighbour, a mother, a daughter, a colleague and a friend. Like the vast majority of refugees. I'd like to believe that I am that person - but I have not and am unlikely to ever be tested in that way. I try to be an active citizen, but I do that with the luxury of luck. I didn't choose to be Australian. I just am. But not as grateful, as appreciative as those that have known a different life. A different reality. And so instead of buying into the media and political rhetoric of fear, prejudice, racism and bigotry - I choose to be somebody that says 'Welcome'. I choose to celebrate the diversity of people, of food, of songs, of culture, of fashion, of dance. The media and politicians saying 'Go back', 'bugger off', 'we have no room' do not speak for me. They speak not of my values. They speak not of my ethics. They speak not of the Australia I want for me and my family. I speak for me. And I say 'Welcome'. One of your best so far I love the part 'I am lucky to be Australian. I am not special. I am not unique. I am not more worthy. I am just lucky.' this is very much like what I tell my kids - 'we are not better than anyone else - we are the same. Some people are less lucky, some are more lucky but we all deserve the same respect and to be treated fairly' Thank you for writing!